You know how hard it is to cover something in stickers? Like how to get the stickers just right, so they are totally smooth, straight, and free of air pockets? This is like that, but bigger. And on a city bus. 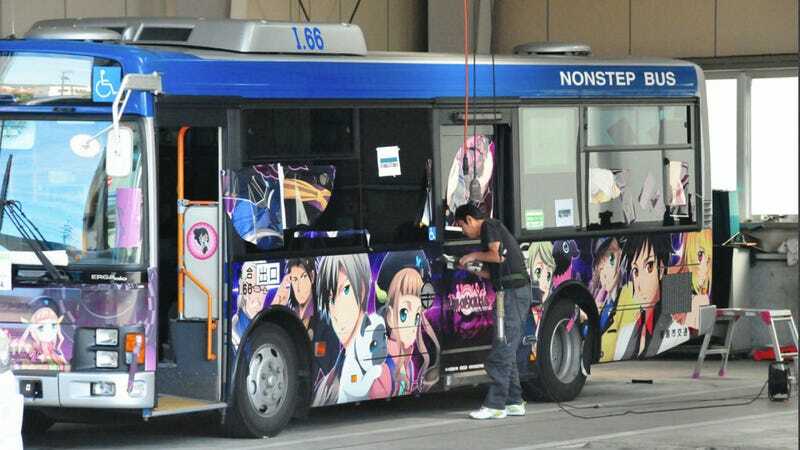 A fleet of buses is getting "wrapped" for the "Machi Asobi" otaku (geek) event in Tokushima, Japan. Website Gigazine was on hand to document just how taxing it is to wrap these vehicles. Here, the wrapping promotes Japanese role-playing game Tales of Xillia 2. This kind of wrapping isn't only used to promote video games—or only on buses. Train and Monorail wrapping is also common and can feature things like popular characters, restaurant chains, tea, or even instant ramen.